Upon the Restoration in 1660 Charles II appointed his brother, James, Duke of York (later James II), to the position of Lord High Admiral, in which capacity he commanded the Royal Navy during the Second (1665-7) and Third (1672-4) Anglo-Dutch Wars [the First (1652-4) took place in Cromwell's time]. The series of conflicts with the Dutch Republic errupted over control of trade routes and colonies. 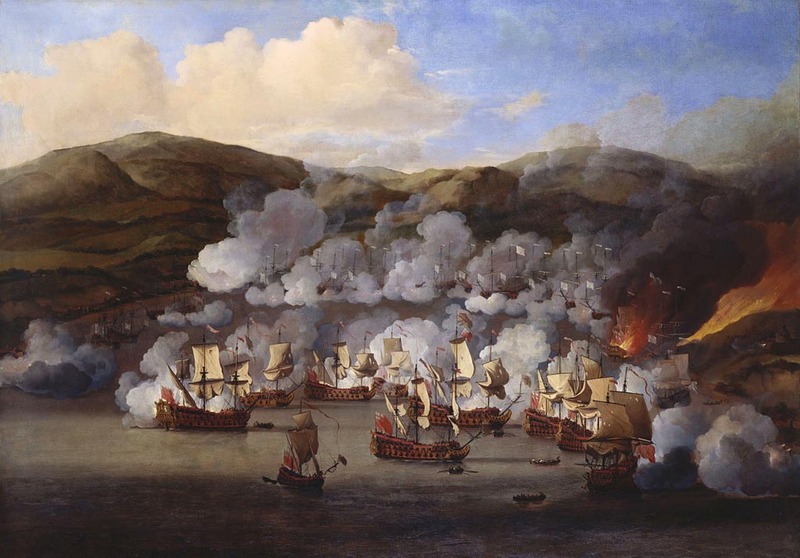 In 1675 the Duke of York commissioned from the recently-arrived Dutch artists, father and son, Willem van de Velde the Elder and Willem van de Velde the Younger, a set of 12 large canvases depicting naval battles and incidents in these two conflicts and the ongoing struggle against the Barbary Corsairs. Previous commissions of this type had been for tapestries, like the famous Armada set hanging at this date in the House of Lords. The Van the Veldes' paintings in this series have the character of tapestries, with high view points and a crowding of incidents, as opposed to the sea-level, atmospheric views of their other oil paintings, such as The 'Royal Escape' in a Breeze. Most of the paintings in this set show a degree of collaboration between father and son, although these two are predominantly by van de Velde the Younger. (cat. 9). It is likely that the Van de Veldes were involved in a commission from Charles II for a series of tapestry designs to commemorate the battle of Solebay in 1672, which were executed by the Mortlake tapestry works. The Attack on the French Ships at Martinique illustrates an episode on 6 July 1667 in which Sir John Harman, Commander-in-Chief in the West Indies, found a force of French ships of the West India Company at Fort Saint-Pierre in Martinique. With only nine ships, Harman silenced the guns and set fire to 20 French ships, including the flagship, the Lys Couronné. The dramatic scene is shown from the sea, with the nine English ships in a circle in the bay. Though this was a decisive victory over the French, the battle of Martinique did not alter the course of the Second Anglo-Dutch War or the terms agreed at the Treaty of Breda (31 July 1667), nor did it affect the ownership of the island, which remained French. Text adapted from Charles II: Art and Power, London, 2017.